A fast-acting, long-lasting 100% Nitrosigine® formula created to increase blood flow during exercise. Nitrosigine® promotes focus, energy, pump, and recovery. 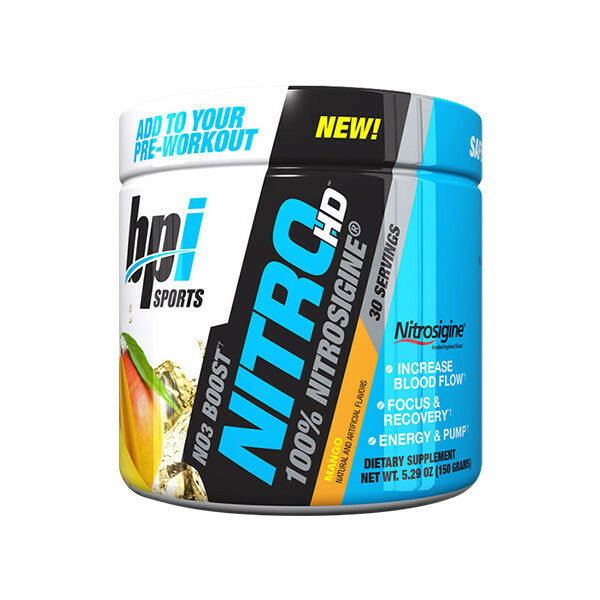 Whether you’re trying to improve your performance or simply love getting that full, hard look at the gym, Nitro HD™ can help. Feel the effects in as little as 15 minutes and enjoy the benefits for up to six hours! Natural & Artificial flavours, Sucralose, Acesulfame-k, Maltodextrin, Citric Acid, Silica. Take one serving (1 Scoop) approximately 15-30 minutes prior to training, blended into 235ml of cold water or beverage, with or without food, or as suggested by a qualified healthcare practitioner. Not intended for use by persons under the age of 18. Do not exceed recommended dose. Get consent of a license physician before using this product, especially if you are taking medication, have a medical condition, you are pregnant, nursing or thinking about becoming pregnant. DISCONTINUE USE TWO WEEKS PRIOR TO SURGERY. KEEP THIS PRODUCT AND ALL SUPPLEMENTS OUT OF REACH OF CHILDREN.